rections to where your next stop will be. It’ll even tell you when a building was built and any architectural significance that relates to it,” he described the latest features. Complimenting both era’s mediums, the app’s enhanced qualities such as visual clues, audio recordings, readable material, and satellite mapping, is setting Waxahachie apart from other towns. “We don’t really see other cities our size doing this,” Nehib recognized. 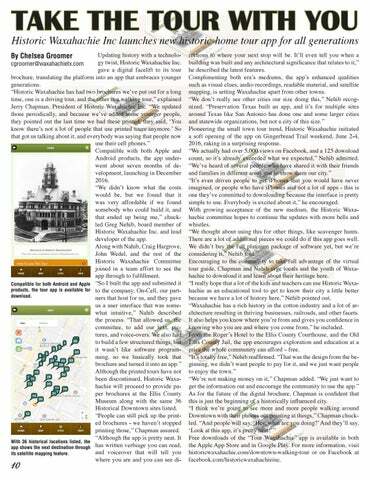 “Preservation Texas built an app, and it’s for multiple sites around Texas like San Antonio has done one and some larger cities and statewide organizations, but not a city of this size.” Pioneering the small town tour trend, Historic Waxahachie initiated a soft opening of the app on Gingerbread Trail weekend, June 2-4, 2016, raking in a surprising response. “We actually had over 5,000 views on Facebook, and a 125 download count, so it’s already exceeded what we expected,” Nehib admitted. “We’ve heard of several people who have shared it with their friends and families in different areas just to show them our city.” “It’s even driven people to get iPhones that you would have never imagined, or people who have iPhones and not a lot of apps - this is one they’ve committed to downloading because the interface is pretty simple to use. Everybody is excited about it,” he encouraged. With growing acceptance of the new medium, the Historic Waxahachie committee hopes to continue the updates with more bells and whistles. “We thought about using this for other things, like scavenger hunts. There are a lot of additional pieces we could do if this app goes well. We didn’t buy the full platinum package of software yet, but we’re considering it,” Nehib told. Encouraging to the community to take full advantage of the virtual tour guide, Chapman and Nahib urge locals and the youth of Waxahachie to download it and learn about their heritage here. “I really hope that a lot of the kids and teachers can use Historic Waxahachie as an educational tool to get to know their city a little better because we have a lot of history here,” Nehib pointed out. “Waxahachie has a rich history in the cotton industry and a lot of architecture resulting in thriving businesses, railroads, and other facets. It also helps you know where you’re from and gives you confidence in knowing who you are and where you come from,” he included. From the Roger’s Hotel to the Ellis County Courthouse, and the Old Ellis County Jail, the app encourages exploration and education at a price the whole community can afford – free. “It’s totally free,” Nehib reaffirmed. “That was the design from the beginning, we didn’t want people to pay for it, and we just want people to enjoy the town.” “We’re not making money on it,” Chapman added. “We just want to get the information out and encourage the community to use the app.” As for the future of the digital brochure, Chapman is confident that this is just the beginning of a historically influenced city. “I think we’re going to see more and more people walking around Downtown with their phones out pointing at things,” Chapman chuckled. “And people will say, ‘Hey, what are you doing?’ And they’ll say, ‘Look at this app, it’s pretty neat!’” Free downloads of the “Tour Waxahachie” app is available in both the Apple App Store and in Google Play. For more information, visit historicwaxahachie.com/downtown-walking-tour or on Facebook at facebook.com/historicwaxahachieinc.